Great action shots of Jet Sprint boats in the middle of a wheat field – by Mark Sharley. Mark Sharley’s gallery of amazing IHBA action from Firebird Lake in Chandler, AZ. Mark Sharley’s gallery of the NASCAR Nextel Cup race at Phoenix, won by Jimmy Johnson. 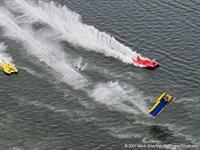 Mark Sharley’s old archives of the 2004 jetboat action.